Halloween season is in full swing and today will be loaded with fun and festive activities. The last thing you need is a major plumbing disaster to put a damper on your plans. Keep the good times rolling by avoiding these Halloween plumbing nightmares. Don’t Let These Halloween Plumbing Disasters Happen to You! 1. Pumpkin goo goes in the trash, not in the sink! If carving pumpkins are part of your Halloween plans then it is important to be mindful of where you dispose of those pumpkin seeds. Pumpkin seeds and goo will clog your sink and become tangled in your garbage disposal. Choosing to flush your pumpkin goo down your toilet will also land you in the middle of a plumbing nightmare. It is best to simply toss all of your pumpkin parts in the trash, where they cannot do any damage to your plumbing. 2. Put a stop to all of the scary sounds. Do your pipes make banging, thumping or other strange noises? Have you tried to convince yourself that these haunting sounds are normal or that your house is simply settling? The truth is that when you hear your pipes making these noises it may be a warning sign of something seriously wrong. Your water pressure may be too high or even worse, some of your pipes could be loose! Loose pipes can cause flooding in your home and other issues and you will want to have them fixed right away to avoid a real plumbing nightmare. To find out the cause of those noisy pipes call us at (866) 844-3770 today! 3. Take care of those leaky faucets. Does the sound of a dripping faucet keep you awake at night? The scariest thing about a leaky faucet is all of the extra money you are wasting on your water bill. Even a small or slow leak will add up. Have your leaky faucet fixed and stop your money from going down the drain. 4. Remember you are not alone. Finally, keep in mind that if a plumbing nightmare does strike your home, we are here for you. We offer true 24/7 emergency plumbing, heating, air conditioning and electrical services. So, if the worst should happen this Halloween, simply give us a call at (866) 844-3770 or visit TrustTiger.com. Bathroom renovations are a great way to upgrade your home and increase its value. To help you get a better understanding of where to start with your bathroom renovations here is a list of some of the best upgrades that will add some real value to your home. Lighting is an important feature in any bathroom. No one wants to bathe, groom or get ready in a dark or poorly lit bathroom. Updating light fixtures can be a relatively affordable first step in your renovation process. Additionally, there are so many design options when it comes to bathroom lighting fixtures and you could really change the whole look and feel of your space. If you have the space in your bathroom, consider upgrading your old single vanity to a double. Just think no more morning battles over a single sink, small mirror and a limited counter top. You will love the extra space and if you ever decide to sell your home, potential buyers will love the double vanity. A water saving toilet will not only save you money on your water bill, but it will also help increase your home’s value. Drawer and cabinet handles, electrical fixtures, door knobs and towel racks may seem like an afterthought, but these small details go a long way in the overall appeal of your space. You will be amazed at how different your bathroom looks, simply by upgrading your fixtures. If your bathroom is lacking an exhaust fan, or yours is severely out of date, it is time to have a new one installed. Exhaust fans do more than simply prevent your mirror from becoming all foggy while you are showering. These fans also perform other valuable functions, like helping to prevent mold growth in your bathroom. Need an Electrician to install your new exhaust fan? Interested in larger bathroom remodeling projects? Wanting a new shower or bathtub installed? Call us at (866) 844-3770 today and ask about our options for bathroom renovations. Electricity is a valuable resource that is interwoven within just about every aspect of our daily lives. It is easy to take the electricity in our lives for granted. When we flip a switch, we just naturally assume that the lights will come on and work safely. Thanks to modern electrical advances and skilled Electricians, like ours, electricity is generally safe to use. However, electricity is still dangerous if not used properly or when electrical concerns go unaddressed. Be on the lookout for these all too common household electricity issues that could be dangerous for you or your family. 1. Using the wrong light bulbs. It is important to check the wattage rating on your lamps and light fixtures. Make sure that you never use higher wattage light bulbs than your lamp fixture is designed to handle. The heat put off by higher wattage light bulbs can melt through and/or scorch your fixture’s socket and wiring. This is a leading cause of electrical fires in residential homes. Keep in mind that using the wrong light bulb may not cause a fire right away, it typically takes time, but it is best to avoid that risk altogether and use the right wattage light bulbs. 2. You do not have enough electrical outlets. If you find yourself using extension cords and power strips throughout your home, you may want to consider having a few more electrical outlets installed. Using a few heavy-duty extension cords in your home is usually perfectly safe. Just remember to avoid overloading the circuits and that these cords are free from damage or obstruction. However, the best option is to have more outlets installed, especially in rooms that use the most electrical devices. 3. Your home is lacking Ground Fault Circuit Interrupters (GFCIs). Properly installed and maintained GFCIs play a vital role in protecting your ho me. GFCIs are designed to shut down an electrical current when there is moisture present or a circuit becomes overloaded. This protects you and your family from dangerous and possibly deadly shocks. Once the GFCIs shut down the current you are required to push a button next to the receptacle to get the current flowing again. GFCIs should always be used in locations where water maybe present, kitchens and bathrooms are particularly vulnerable. GFCIs are required in all new homes, but if you do live in an older home it is possible that you are missing GFCIs in key locations. You will want to upgrade to GFCIs to make your home safer. 4. Frayed or damaged outdoor wiring. Outdoor electricity is a major convenience, but since it is exposed to the elements, wiring is vulnerable to damage. If you notice your outdoor electrical fixtures behaving oddly, it is time to call in the experts. For example, if your outdoor lights tend to flicker, this is a sign that your wiring could be frayed or damaged and in need of repairs, to avoid a potential fire hazard. 5. Your outlets are damaged. Have you noticed a plug-in that is loose or a little wobbly in an outlet? If so, it is time to replace that outlet. Loose connections can often lead to sparks which create a fire hazard. This makes it a much safer option for you to have all of the damaged or loose outlets in your home replaced by one of our expert Electricians. You probably do not give your furnace filter much thought but it plays an important role in keeping your family healthy and your HVAC system running efficiently. What makes your furnace filter so important? Take a deep breath. How is the air quality in your home? The condition of your furnace filter helps improve you and your family’s quality of living. There are different types of furnace filters ranging from basic to high efficiency models. The type of furnace filter used in your home will depend on the type of HVAC system in your home. However, the functions of any furnace filter are basically the same. Furnace filters are designed to work with your heating and cooling system to improve your indoor air quality. Additionally, furnace filters also work to help protect and extend the life of your furnace. Debris and dust are drawn into your furnace through your return ducts and without a filter the debris will collect on the heat exchanger, fan, coil, etc. causing your unit to work longer and harder, leading to early system failure. Why should you clean/replace your furnace filters regularly? A dirty furnace filter means air has trouble flowing through your system. Greatly hindering the amount of heating and cooling your system can do. If your system cannot heat and cool properly your evaporator coil can freeze up if the across air flow is low, which can cause your AC unit to stop working altogether. A worn out or dirty furnac e filter will also affect the efficiency levels of your HVAC system. Your fan has to work so much harder to pull air through the dirty coil. Your HVAC system will consume more energy having to run longer and harder, costing you more money on your power bill. 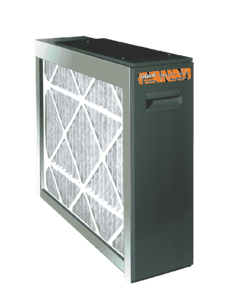 However, a clean furnace filter will allow air to flow freely through your HVAC system, saving energy and money, while still blocking pollutants and allergens. Your furnace filter and your indoor air quality are intertwined. Once your filter becomes clogged with dust, air flow will be restricted, causing dust to settle throughout your ductwork. This dust will then be blown into the air you and your family breathe. Dust mites, bacteria and other allergens will be able to grow in your ductwork and be released into the air. How can you ensure that your furnace filter is clean and functioning properly? Your filter is located in your furnace and most are disposable. If you have a disposable filter, remember to change it every 1 to 3 months (although some filters may last up t o six months) depending on the type of filter you have and the cleanliness of your system. There are a few other factors that will determine how frequently you will need to change your filter. For example, if you have pets, smoke or anyone in your home suffers from allergies; your filter should be changed more often. Additionally, fiberglass filters need to be changed sooner than pleated filters. These disposable furnace filters are typically only capable of removing 3-5% of the debris and dust particles that pass through them. There are other options when it comes to furnace filters, some of these are permanent and more efficient. To learn more about these higher efficiency filters or to have any of your heating or cooling concerns addressed, call us at (866)844-3770. Fall has finally arrived and as the cooler temperatures begin to roll in it is important to keep the following electrical safety tips in mind to help protect your home and family. Be sure to only use weatherproof electrical devices and lights outdoors. Clear away all debris and leaves from outdoor power cords and outlets. Test all smoke and CO detectors and change batteries as needed. Replace all damaged or frayed electrical cords inside and outside of yo ur home. If you use electric blankets, make sure they are working properly and the power cords are not damaged or frayed. Replace loose plugs to prevent overheating or electrical fires. Have your circuit breakers inspected if you are having to reset them constantly. With the holidays coming up, remember not to overload your outlets with too many plug ins. Be careful where you place extension cords and remember to never run cords underneath rugs or furniture. Remember to have one of our Electricians perform an electrical tuneup and safety inspection to ensure all of your electrical components are functioning properly. Follow these electrical safety tips this fall and have a safe and fun season!